When you check in please let us know if there is anything damaged or broken in the unit to avoid any questions after your stay. If there are any cleaning issues or concerns, please let us know right away so we can take care of them for you (828-488-5626). We can not compensate for issues reported following your stay. In the summer only, turn the AC down 3-4 degrees at a time. Please don’t turn it down more than that or it will freeze up the unit and won’t it work.Please do not move the furniture as this can cause damage to the floors. Check out time is no later than 10:00 am. Please make sure to depart on time as there may be new guests checking in that afternoon, and our housekeeping staff needs adequate time to prepare the property. Additional fees may be incurred if the check out time is not adhered too. The linens will be taken care of by the cleaners after your checkout. Please remove sheets and pillowcases from beds that were used and place used towels in a pile in the bathroom. Please wash and put away all dishes. Please remove all trash from the unit before you leave. Make sure to check unit to see if you have left anything behind. Items can be returned which were inadvertently left, via mail on a C.O.D. basis. Rates subject to change without notice. All items are kept for only 30 days before being disposed of. WINTER PLEASE LEAVE THE HEAT ON AND SET TO 55 DEGREES WHEN YOU ARE READY TO DEPART. SUMMER PLEASE LEAVE THE AC ON AND SET TO 80 DEGREES WHEN YOU ARE READY TO DEPART. Yes, our cabins are pet friendly with prior approval. We do require a non-refundable pet fee of $50, additional for more than 2 pets. Pets must be well-behaved and preferably crated if they must be left at the cabin. Guests are also responsible for any damage caused by their pets and agree to pay for any charges that might arise from said damage. If we haven’t been advised that you brought a pet, and our cleaning staff informs us otherwise, there will be an automatic nonrefundable fee of $150 charged to the credit card on file. Is smoking permitted in your cabins? For the courtesy of our non-smoking guests, we ask that you refrain from smoking inside the cabin at all times. Ashtrays are provided on the porches of all cabins. If there is smoking in the cabins, odor of smoke, or damage from smoking to the cabin, there will be a $100 additional cleaning charge automatically charged to your credit card. 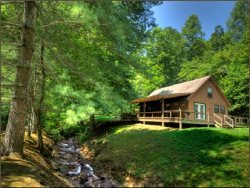 Is internet access available at your cabins? Several of our properties are equipped with wireless internet access. Each cabin that is equipped with internet will be noted under the "Property Amenities" section. You may also search specifically for properties with internet access through our Advanced Search Options. Please understand that internet connectivity is often unreliable in the mountains. If this is the case, you are welcome to access our internet at our office location, we are open 8:00 - 5:00 PM. Internet outages are not cause for refund.